In SAS, many-to-many merges are handled very differently via Data Step MERGE and PROC SQL JOIN. Suppose you have two data sets. 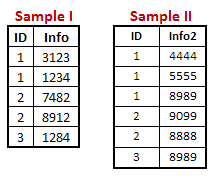 You want to merge both the data sets but there are duplicate values in the common variable (ie. primary key) of any or both of the datasets. The DATA step Merge does not handle many-to-many matching very well. When we perform many to many merges. the result should be a cartesian (cross) product of matching observations. For example, if there are three records that match from one contributing data set to two records from the other, the resulting data set should have 3 × 2 = 6 records. Data Step MERGE does not create a cartesian product in case of a many-to-many relationship. 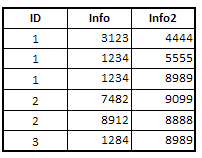 It will return number of records for a duplicate value equal to maximum number of the duplicate value in both the table. Note : In this example, we have 2 1s in dat1 and 3 1s in dat2. 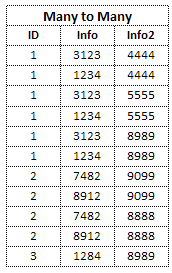 The maximum number of 1s in both the tables is 3. So it would return 3 1s in the merged dataset. PROC SQL JOIN creates all possible combinations of matching observations in case of a many-to-many relationship. Cartesian product is a collection of all pairs of two given sets. For example, In ID variable, there are 2 1's in dat1 dataset and 3 1's in dat2 dataset, the cartesian product would be (3*2 = 6 Observations) in the final result. 9 Responses to "SAS : Many to Many Merge"
why the sql code says left join? Shouldn't it be cross join? Here we are talking about all possible combinations of matching observations (not all possible combinations of all the values). Primary key exists here. Hope it helps. can you please explain how it writes the value 1234 in info for last 1 in output : Merge ?